A Welsh contractor has been fined and its director banned from running a company after a labourer fell seven metres from an unguarded balcony. 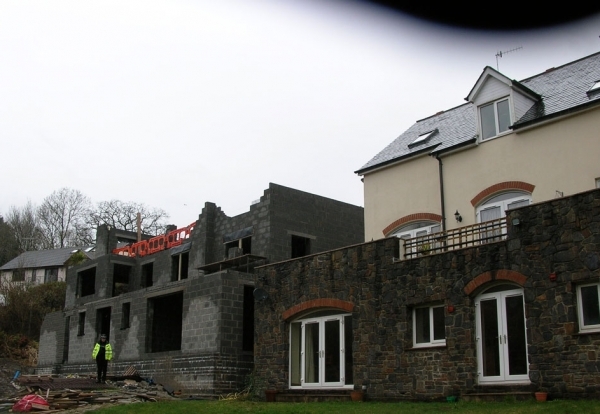 Karl Kraus, 31, from Pembroke Dock was employed by Preseli Construction & Maintenance Ltd to help build a large domestic property at Incline Way, Saundersfoot. Haverfordwest Magistrates’ Court heard that on 25 March 2010, Kraus was instructed to remove a concrete block that had been placed across a doorway. As he threw the block, he fell backwards on to the balcony and then seven metres to the ground below. The Health and Safety Executive found that the three-storey house was being built without scaffold or any form of fall prevention. Kraus spent six days in Morriston Hospital in Swansea where he underwent surgery to pin the bone in his left heel and was in a plaster cast for approximately ten months. Still in constant pain and unable to walk on uneven ground without risking a fall, he is due to undergo further surgery to prevent any further damage to his foot, but his career in the construction industry is over. Christopher Newell of Tenby was fined £4,000, with costs of £2,376.25. He is also disqualified from acting as a company director, managing or in any way controlling a company for at least two years. Speaking after the hearing, HSE inspector Anne-Marie Orrells said: “Mr Kraus is still a young man who’s life has been turned upside down after receiving significant long-term injuries in this incident.